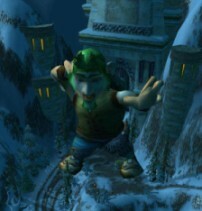 Hi there, the name's Brumboldt from Thorium Brotherhood. I have always been interested in making Machinima and am attempting to start. Kinda brain dead, so nice to meet you all. Thanks, now to start tapping this vast knowledge base so that I can begin to undertake my first Machinima. GNOMES SHALL RULE YOU ALLL! My Gnome the size of the Gates of Ironforge will destroy you silly horde and alliance! shadows or it didn't happen.